Benny Katzover welcomes the new commander of the IDF's Judea and Samaria Division, condemns predecessor Nitzan Alon's behavior. Benny Katzover, Chairman of the Shomron (Samaria) Residents Committee, welcomed on Tuesday the appointment of Hagai Mordechai to the position of Commander of the IDF’s Judea and Samaria Division. Mordechai is replacing Brigadier General Nitzan Alon, who held the position for over two years and whose views more often than not clashed with the Jewish residents of Judea and Samaria. In an interview with Arutz Sheva, Katzover expressed hope that Mordechai’s appointment will mark the beginning of new and better relations between the IDF and Jewish residents of Judea and Samaria than there were during the term of his predecessor. In the NYT interview, Alon also expressed concern over “increasing violence” by “radical Israeli settlers,” colloquially called ‘price tag’ operations, which he called “Jewish terrorism,,” equating alleged vandalism with Arab terrorist murders, and called on U.S. Congress not to freeze aid to the Palestinian Authority in response to the unilateral PA statehood bid. After that interview, Katzover condemned Alon’s statements, saying Alon had “spit on the rule of law.” On Tuesday, he said that Alon’s term as Commander of the Judea and Samaria Division will be remembered as one of the most difficult periods in history. 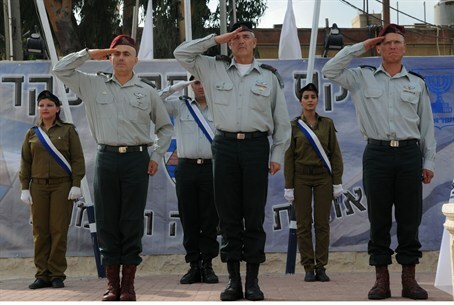 Katzover praised the incoming commander, Brig.-Gen. Mordechai.